Everybody knows him. You know, that guy who is endlessly trying to impress the ladies. He’s not one of those jerks wearing nine hundred dollar jeans with an Ed Hardy t-shirt two sizes too small and a trucker hat from Barbie's deluxe mansion. This guy is smooth; he’s a musician, an intellectual, and a genuine romantic. He's the type who wouldn't hesitate wooing some transit maiden with his best Celine Dion rendition while Swayze-sliding down the skytrain isle. There's only one catch - kissing this frog isn't going to turn him into Prince Charming. The Pacific chorus frog (Pseudacrus regilla) is the pop star of the frog world. Every spring males find a breeding pond and sing to attract females - almost as if saying 'how you doing' as loud as possible. With so many males competing to attract a mate, their singing can be surprisingly loud. 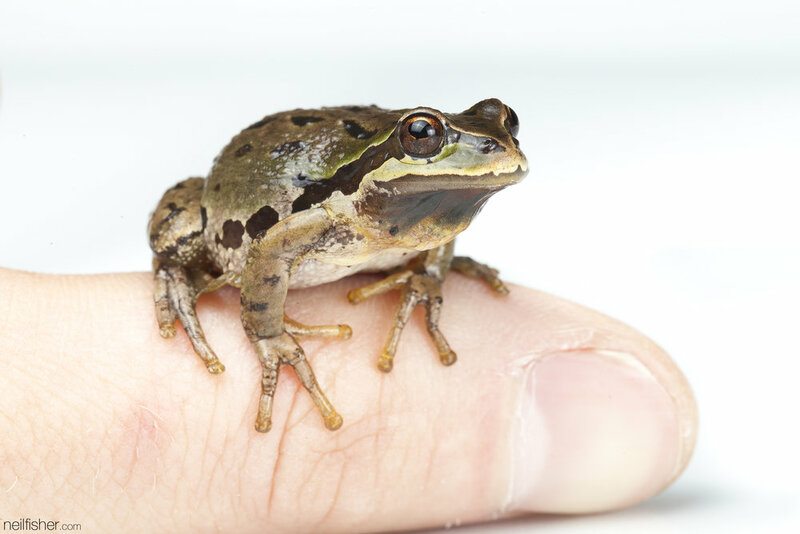 Even more surprising is the Pacific chorus frog is no bigger than five centimetres in length, making their considerable voice all the more impressive. Though the Pacific chorus frogs are most vocal in the spring while breeding, they can still be heard the rest of the year singing in rainstorms. It may seem like constantly vocalizing is asking for trouble, what predator is going to pass up a soft and chewy chorus snack that announce its location to all? Well the Pacific chorus frog has a trick to combat those unintentionally drawn in by its siren; they can throw their voice. To conceal its true location the frog can throw its voice, making it rather challenging for a potential predator to narrow in by pursuing the sound. As a last resort, if feeling threatened the Pacific chorus frog will stop calling completely - making them very difficult to find. This Romeo is rather selective when choosing a pond for breeding and for a good reason too. They after a special spot known as an 'ephemeral' wetland, a marsh or pond that will dry by midsummer. Using temporary water means the Pacific chorus frog avoids predatory fish and amphibians that need a permanent body of water. This clever tactic allows them to breed in a relatively safe environment and increases the likelihood their offspring will survive. Unlike the seven-year metamorphosis of the Pacific tailed frog, the Pacific chorus frog transforms rather quickly. From the time the eggs are laid it only takes two to three weeks for the embryos to develop and hatch tiny tadpoles. From there, it's roughly two months to complete metamorphosis from tadpole to frog. Interestingly, metamorphosis isn’t the last change for these frogs. They are able to quickly change their colouration; anything from light green to dark brown. It’s thought this colouration change is in response to temperature and humidity. Although the population of Pacific chorus frogs is currently doing well in BC, that doesn’t mean its future is smooth sailing. With the continuous loss of habitat, this wetland Pavarotti is running out of healthy places to live. Currently the Pacific chorus frog is on the provincial Yellow list, which is managed at the ecosystem level. So the next time you’re watch a Hollywood blockbuster where Arnold is chasing Obama through a jungle and as the gun fire stops just long enough that you hear frogs calling, remember the Pacific chorus frog who’s quickly running out of places to live.